Supply chain management under uncertainty and risk has become the target of extensive research. A review of the corresponding literature indicates mainly theoretical approaches, which attempt to provide solutions to certain problems. 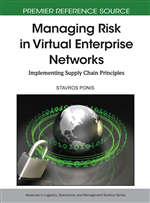 In this chapter, a theoretical framework of supply chain risks analysis is proposed. Within this framework, studied risks are determined by possible disruptions that affect supply chain ability to function normally. Thus, supply chain performance parameters are taken as a basis for a risk measurement system. Correspondingly, supply chain reliability parameters and performance fluctuations are studied in order to manage risks. A possible implementation of the proposed framework is discussed through the presentation of a simulation example. Still, the evaluation of the proposed framework’s practical application remains an item of the future research agenda. The ultimate objective of the research presented in this chapter is the elaboration of a software solution for supply chain modelling and risk evaluation. First, the different perceptions on the terms of risk and uncertainty should be discussed. Though these terms have been the object of very extensive research in various scientific directions for many years, the clear and unique formulations of their meaning have not been stated yet (Brindley & Ritche, 2004). It is possible to define at least two basic schools of thought on the issue of whether risk and uncertainty have the same meaning. Some publications do not make a sharp distinction between the meanings of risk and uncertainty. Another way to distinguish between the two terms relies on the ability to make probability assessments: risk corresponds to events that can be associated with given probabilities; and uncertainty corresponds to events for which probability assessments are not possible (Chanvas, 2004; Borodzicz, 2005; Crouhy, Galai & Mark, 2006). This suggests that risks are easier to evaluate than uncertainties. It is also necessary to point out that unexpected profit is discussed as a possible risk variation in the context of financial management (Shapkin, A. & Shapkin, B., 2005). Still, these risks are beyond the scope of this chapter. In the proposed research, any potential harm that may arise in the future due to current operation or some future events constitutes risk. It is suggested that any risk appears due to a changing environment formed by different uncertainties, and uncertainty is recognized as a negative characteristic of an environment (Cucchiela & Gastaldi, 2006; Waters 2007). Thus, the following risk definition is used: risk is any uncertainty that affects a system in an unknown fashion; its ramifications are unknown, but it brings great fluctuation in value and outcome (Mun, 2006). It should be noticed that each uncertainty can cause a risk event in the future, yet not all uncertainties produce risk for the operation of certain systems.